In addition to your fun adventure of sailing around Cape Cod or Annapolis, a sail aboard The Liberté also presents you with a unique opportunity for an exciting history lesson. In addition to your fun adventure of sailing around Cape Cod or Annapolis, a sail aboard The Liberté also presents you with a unique opportunity for an exciting history lesson. As you embark on the waters of Cape Cod or sail along the Chesapeake Bay, you can enjoy the beautiful weather while learning something new with your experience. Why learn the history of these coastal cities anywhere else? Set sail on a fun and informative history lesson with The Liberté today! As you are sailing along the coast of Cape Cod, Massachusetts, you can take in the beautiful sights of historic lighthouses and beautiful summer cottages. Not only are these sights of Cape Cod colorful, scenic photo opportunities from the water, but they are also full of fascinating history that you can learn about from The Liberté. Enjoy a short presentation on the history of the Elizabeth Islands and the Cape with plenty of opportunities to ask questions on your favorite sites and learn more as you go. 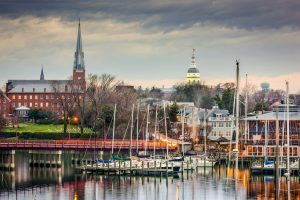 Along with being a beautiful coastal city of the United States, Annapolis is also the capital of Maryland. What better way to learn about this nautical, capital city than from the water where you can see it all? From views of the colorful historic houses of downtown Annapolis to the beautifully recognizable Naval Academy from the water, there is so much to see and learn about from the waters of the Severn River and the Chesapeake Bay. With each historical fact that you learn on your sail around Annapolis or Cape Cod, you will inevitably have plenty of opportunities to take in unique views of historic landmarks. Enjoy this fun and exciting perspective from the water by taking plenty of pictures and asking questions about your favorite sights! No matter which occasion or day of fun you plan to share aboard The Liberté, you are sure to learn something exciting about one of these beautiful coastal cities on board! Plan Your Perfect Day of Sailing Aboard The Liberté Today! This entry was posted on Friday, March 22nd, 2019 at 10:03 am. Both comments and pings are currently closed.